Many early aviation records, including first woman to fly solo across the Atlantic Ocean. Amelia Mary Earhart (/ˈɛərhɑːrt/; July 24, 1897 – disappeared July 2, 1937) was an American aviation pioneer and author. [N 1] Earhart was the first female aviator to fly solo across the Atlantic Ocean. [N 2] She received the U.S. Distinguished Flying Cross for this accomplishment. She set many other records, wrote best-selling books about her flying experiences and was instrumental in the formation of The Ninety-Nines, an organization for female pilots. In 1935 Earhart became a visiting faculty member at Purdue University as an advisor to aeronautical engineering and a career counselor to women students. She was also a member of the National Woman's Party and an early supporter of the Equal Rights Amendment. Earhart was the daughter of Samuel "Edwin" Stanton Earhart (1867-1930) and Amelia "Amy" (nee Otis) (1869–1962). She was born in Atchison, Kansas, in the home of her maternal grandfather, Alfred Gideon Otis (1827–1912), who was a former federal judge, the president of the Atchison Savings Bank and a leading citizen in the town. Amelia was the second child of the marriage, after an infant stillborn in August 1896. She was of part German descent. Alfred Otis had not initially favored the marriage and was not satisfied with Edwin's progress as a lawyer. According to family custom, Earhart was named after her two grandmothers, Amelia Josephine Harres and Mary Wells Patton. From an early age, Earhart, nicknamed "Meeley" (sometimes "Millie") was the ringleader while her younger sister (two years her junior), Grace Muriel Earhart (1899–1998), nicknamed "Pidge", acted the dutiful follower. Both girls continued to answer to their childhood nicknames well into adulthood. Their upbringing was unconventional since Amy Earhart did not believe in molding her children into "nice little girls." Meanwhile their maternal grandmother disapproved of the "bloomers" worn by Amy's children and although Earhart liked the freedom they provided, she was aware other girls in the neighborhood did not wear them. A spirit of adventure seemed to abide in the Earhart children, with the pair setting off daily to explore their neighborhood. [N 4] As a child, Earhart spent long hours playing with sister Pidge, climbing trees, hunting rats with a rifle and "belly-slamming" her sled downhill. Although this love of the outdoors and "rough-and-tumble" play was common to many youngsters, some biographers have characterized the young Earhart as a tomboy. The girls kept "worms, moths, katydids and a tree toad" in a growing collection gathered in their outings. In 1904, with the help of her uncle, she cobbled together a home-made ramp fashioned after a roller coaster she had seen on a trip to St. Louis and secured the ramp to the roof of the family toolshed. Earhart's well-documented first flight ended dramatically. She emerged from the broken wooden box that had served as a sled with a bruised lip, torn dress and a "sensation of exhilaration." She exclaimed, "Oh, Pidge, it's just like flying!" Although there had been some missteps in his career up to that point, in 1907 Edwin Earhart's job as a claims officer for the Rock Island Railroad led to a transfer to Des Moines, Iowa. The next year, at the age of 10, Earhart saw her first aircraft at the Iowa State Fair in Des Moines. Her father tried to interest her and her sister in taking a flight. One look at the rickety "flivver" was enough for Earhart, who promptly asked if they could go back to the merry-go-round. She later described the biplane as "a thing of rusty wire and wood and not at all interesting." While the family's finances seemingly improved with the acquisition of a new house and even the hiring of two servants, it soon became apparent that Edwin was an alcoholic. Five years later in 1914, he was forced to retire and although he attempted to rehabilitate himself through treatment, he was never reinstated at the Rock Island Railroad. At about this time, Earhart's grandmother Amelia Otis died suddenly, leaving a substantial estate that placed her daughter's share in a trust, fearing that Edwin's drinking would drain the funds. The Otis house, and all of its contents, was auctioned; Earhart was heartbroken and later described it as the end of her childhood. In 1915, after a long search, Earhart's father found work as a clerk at the Great Northern Railway in St. Paul, Minnesota, where Earhart entered Central High School as a junior. Edwin applied for a transfer to Springfield, Missouri, in 1915 but the current claims officer reconsidered his retirement and demanded his job back, leaving the elder Earhart with nowhere to go. Facing another calamitous move, Amy Earhart took her children to Chicago, where they lived with friends. 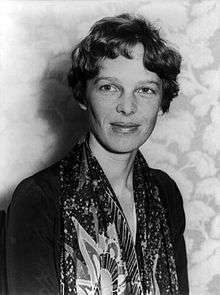 Earhart made an unusual condition in the choice of her next schooling; she canvassed nearby high schools in Chicago to find the best science program. She rejected the high school nearest her home when she complained that the chemistry lab was "just like a kitchen sink." She eventually enrolled in Hyde Park High School but spent a miserable semester where a yearbook caption captured the essence of her unhappiness, "A.E. – the girl in brown who walks alone." During Christmas vacation in 1917, Earhart visited her sister in Toronto. World War I had been raging and Earhart saw the returning wounded soldiers. After receiving training as a nurse's aide from the Red Cross, she began work with the Volunteer Aid Detachment at Spadina Military Hospital. Her duties included preparing food in the kitchen for patients with special diets and handing out prescribed medication in the hospital's dispensary. At about that time, Earhart and a young woman friend visited an air fair held in conjunction with the Canadian National Exposition in Toronto. One of the highlights of the day was a flying exhibition put on by a World War I ace. The pilot overhead spotted Earhart and her friend, who were watching from an isolated clearing, and dived at them. "I am sure he said to himself, 'Watch me make them scamper,'" she said. Earhart stood her ground as the aircraft came close. "I did not understand it at the time," she said, "but I believe that little red airplane said something to me as it swished by." In Long Beach, on December 28, 1920, Earhart and her father visited an airfield where Frank Hawks (who later gained fame as an air racer) gave her a ride that would forever change Earhart's life. "By the time I had got two or three hundred feet [60–90 m] off the ground," she said, "I knew I had to fly." After that 10-minute flight (that cost her father $10), she immediately became determined to learn to fly. Working at a variety of jobs, including photographer, truck driver, and stenographer at the local telephone company, she managed to save $1,000 for flying lessons. Earhart had her first lessons, beginning on January 3, 1921, at Kinner Field, near Long Beach. In order to reach the airfield, Earhart had to take a bus to the end of the line, then walk four miles (6 km). Earhart's mother also provided part of the $1,000 "stake" against her "better judgement." Her teacher was Anita "Neta" Snook, a pioneer female aviator who used a surplus Curtiss JN-4 "Canuck" for training. Earhart arrived with her father and a singular request, "I want to fly. Will you teach me?" Earhart's commitment to flying required her to accept the frequently hard work and rudimentary conditions that accompanied early aviation training. She chose a leather jacket, but aware that other aviators would be judging her, she slept in it for three nights to give the jacket a "worn" look. To complete her image transformation, she also cropped her hair short in the style of other female flyers. Six months later, Earhart purchased a secondhand bright yellow Kinner Airster biplane which she nicknamed "The Canary." On October 22, 1922, Earhart flew the Airster to an altitude of 14,000 feet (4,300 m), setting a world record for female pilots. On May 15, 1923, Earhart became the 16th woman to be issued a pilot's license (#6017) by the Fédération Aéronautique Internationale (FAI). X5665 – 1926 "CIT-9 Safety Plane" – California Institute of Technology (Caltech) Aerospace model 9 Merrill-type biplane designed by Albert Adams Merrill (Instructor in Aeronautics); 45hp Kinner engine; wingspan: 24'0". Throughout this period, her grandmother's inheritance, which was now administered by her mother, was constantly depleted until it finally ran out of money following a disastrous investment in a failed gypsum mine. 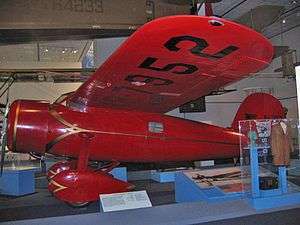 Consequently, with no immediate prospects for recouping her investment in flying, Earhart sold the "Canary" as well as a second Kinner and bought a yellow Kissel "Speedster" two-passenger automobile, which she named the "Yellow Peril." Simultaneously, Earhart experienced an exacerbation of her old sinus problem as her pain worsened and in early 1924 she was hospitalized for another sinus operation, which was again unsuccessful. After trying her hand at a number of unusual ventures that included setting up a photography company, Earhart set out in a new direction. Following her parents' divorce in 1924, she drove her mother in the "Yellow Peril" on a transcontinental trip from California with stops throughout the West and even a jaunt up to Calgary, Alberta. 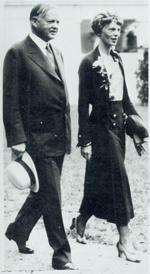 The meandering tour eventually brought the pair to Boston, Massachusetts, where Earhart underwent another sinus operation, which was more successful. After recuperation, she returned to Columbia University for several months but was forced to abandon her studies and any further plans for enrolling at the Massachusetts Institute of Technology because her mother could no longer afford the tuition fees and associated costs. Soon after, she found employment first as a teacher, then as a social worker in 1925 at Denison House, living in Medford, Massachusetts. When Earhart lived in Medford, she maintained her interest in aviation, becoming a member of the American Aeronautical Society's Boston chapter and was eventually elected its vice president. She flew out of Dennison Airport (later the Naval Air Station Squantum) in Quincy, Massachusetts, and helped finance its operation by investing a small sum of money. Earhart also flew the first official flight out of Dennison Airport in 1927. As well as acting as a sales representative for Kinner aircraft in the Boston area, Earhart wrote local newspaper columns promoting flying and as her local celebrity grew, she laid out the plans for an organization devoted to female flyers. After Charles Lindbergh's solo flight across the Atlantic in 1927, Amy Guest (1873–1959) expressed interest in being the first woman to fly (or be flown) across the Atlantic Ocean. After deciding that the trip was too perilous for her to undertake, she offered to sponsor the project, suggesting that they find "another girl with the right image." While at work one afternoon in April 1928, Earhart got a phone call from Capt. Hilton H. Railey, who asked her, "Would you like to fly the Atlantic?" The project coordinators (including book publisher and publicist George P. Putnam) interviewed Earhart and asked her to accompany pilot Wilmer Stultz and copilot/mechanic Louis Gordon on the flight, nominally as a passenger, but with the added duty of keeping the flight log. The team departed from Trepassey Harbor, Newfoundland in a Fokker F.VIIb/3m on June 17, 1928, landing at Pwll near Burry Port, South Wales, exactly 20 hours and 40 minutes later. There is a commemorative blue plaque at the site. Since most of the flight was on instruments and Earhart had no training for this type of flying, she did not pilot the aircraft. When interviewed after landing, she said, "Stultz did all the flying—had to. I was just baggage, like a sack of potatoes." She added, "...maybe someday I'll try it alone." Trading on her physical resemblance to Lindbergh, whom the press had dubbed "Lucky Lindy," some newspapers and magazines began referring to Earhart as "Lady Lindy. "[N 6] The United Press was more grandiloquent; to them, Earhart was the reigning "Queen of the Air." Immediately after her return to the United States, she undertook an exhausting lecture tour in 1928 and 1929. Meanwhile, Putnam had undertaken to heavily promote her in a campaign that included publishing a book she authored, a series of new lecture tours and using pictures of her in mass market endorsements for products including luggage, Lucky Strike cigarettes (this caused image problems for her, with McCall's magazine retracting an offer) and women's clothing and sportswear. The money that she made with "Lucky Strike" had been earmarked for a $1,500 donation to Commander Richard Byrd's imminent South Pole expedition. Studio portrait of Amelia Earhart, c. 1932. Putnam specifically instructed Earhart to disguise a "gap-toothed" smile by keeping her mouth closed in formal photographs. In 1930, Earhart became an official of the National Aeronautic Association where she actively promoted the establishment of separate women's records and was instrumental in the Fédération Aéronautique Internationale (FAI) accepting a similar international standard. In 1931, flying a Pitcairn PCA-2 autogyro, she set a world altitude record of 18,415 feet (5,613 m) in a borrowed company machine. While to a reader today it might seem that Earhart was engaged in flying "stunts," she was, with other female flyers, crucial to making the American public "air minded" and convincing them that "aviation was no longer just for daredevils and supermen." Earhart's ideas on marriage were liberal for the time as she believed in equal responsibilities for both breadwinners and pointedly kept her own name rather than being referred to as "Mrs. Putnam." When The New York Times, per the rules of its stylebook, insisted on referring to her as Mrs. Putnam, she laughed it off. GP also learned quite soon that he would be called "Mr. Earhart." There was no honeymoon for the newlyweds as Earhart was involved in a nine-day cross-country tour promoting autogyros and the tour sponsor, Beech-Nut chewing gum. Although Earhart and Putnam never had children, he had two sons by his previous marriage to Dorothy Binney (1888–1982), a chemical heiress whose father's company, Binney & Smith, invented Crayola crayons: the explorer and writer David Binney Putnam (1913–1992) and George Palmer Putnam, Jr. (1921–2013). 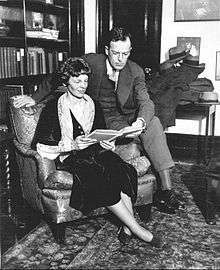 Earhart was especially fond of David, who frequently visited his father at their family home, which was on the grounds of the The Apawamis Club in Rye, New York. George had contracted polio shortly after his parents' separation and was unable to visit as often. On the morning of May 20, 1932, 34-year-old Earhart set off from Harbour Grace, Newfoundland with a copy of the Telegraph-Journal, given to her by journalist Stuart Trueman, intended to confirm the date of the flight. She intended to fly to Paris in her single engine Lockheed Vega 5B to emulate Charles Lindbergh's solo flight five years earlier. [N 9] Her technical advisor for the flight was famed Norwegian American aviator Bernt Balchen who helped prepare her aircraft. He also played the role of "decoy" for the press as he was ostensibly preparing Earhart's Vega for his own Arctic flight. [N 10] After a flight lasting 14 hours, 56 minutes during which she contended with strong northerly winds, icy conditions and mechanical problems, Earhart landed in a pasture at Culmore, north of Derry, Northern Ireland. The landing was witnessed by Cecil King and T. Sawyer. When a farm hand asked, "Have you flown far?" Earhart replied, "From America." The site now is the home of a small museum, the Amelia Earhart Centre. As the first woman to fly solo nonstop across the Atlantic, Earhart received the Distinguished Flying Cross from Congress, the Cross of Knight of the Legion of Honor from the French Government and the Gold Medal of the National Geographic Society from President Herbert Hoover. As her fame grew, she developed friendships with many people in high offices, most notably First Lady Eleanor Roosevelt. Roosevelt shared many of Earhart's interests and passions, especially women's causes. After flying with Earhart, Roosevelt obtained a student permit but did not further pursue her plans to learn to fly. The two friends communicated frequently throughout their lives. [N 11] Another famous flyer, Jacqueline Cochran, who was considered to be Earhart's greatest rival by both media and the public, also became a confidante and friend during this period. 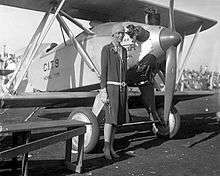 On January 11, 1935, Earhart became the first aviator to fly solo from Honolulu, Hawaii to Oakland, California. [N 12] Although this transoceanic flight had been attempted by many others, notably by the unfortunate participants in the 1927 Dole Air Race that had reversed the route, her trailblazing flight had been mainly routine, with no mechanical breakdowns. In her final hours, she even relaxed and listened to "the broadcast of the Metropolitan Opera from New York." That year, once more flying her faithful Vega that Earhart had tagged "old Bessie, the fire horse,"[N 13] she flew solo from Los Angeles to Mexico City on April 19. The next record attempt was a nonstop flight from Mexico City to New York. Setting off on May 8, her flight was uneventful although the large crowds that greeted her at Newark, New Jersey were a concern, because she had to be careful not to taxi into the throng. Earhart again participated in long-distance air racing, placing fifth in the 1935 Bendix Trophy Race, the best result she could manage considering that her stock Lockheed Vega, topping out at 195 mph (314 km/h), was outclassed by purpose-built air racers that reached more than 300 mph (480 km/h). The race had been a particularly difficult one as a competitor, Cecil Allen, died in a fiery takeoff mishap and rival Jacqueline Cochran was forced to pull out due to mechanical problems, the "blinding fog", and violent thunderstorms that plagued the race. Between 1930 and 1935, Earhart had set seven women's speed and distance aviation records in a variety of aircraft including the Kinner Airster, Lockheed Vega, and Pitcairn Autogiro. By 1935, recognizing the limitations of her "lovely red Vega" in long, transoceanic flights, Earhart contemplated, in her own words, a new "prize... one flight which I most wanted to attempt – a circumnavigation of the globe as near its waistline as could be." For the new venture, she would need a new aircraft. 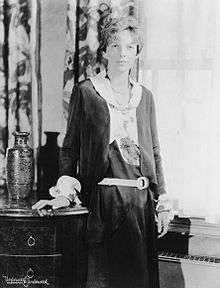 While Earhart was away on a speaking tour in late November 1934, a fire broke out at the Putnam residence in Rye, destroying many family treasures and Earhart's personal mementos. Putnam had already sold his interest in the New York based publishing company to his cousin, Palmer Putnam. Following the fire, the couple decided to move to the West Coast, where Putnam took up his new position as head of the editorial board of Paramount Pictures in North Hollywood. [N 14] While speaking in California in late 1934, Earhart had contacted Hollywood "stunt" pilot Paul Mantz in order to improve her flying, focusing especially on long-distance flying in her Vega and wanted to move closer to him. Amelia Earhart's Lockheed Electra 10E. During its modification, the aircraft had most of the cabin windows blanked out and had specially fitted fuselage fuel tanks. Earhart joined the faculty of Purdue University in 1935 as a visiting faculty member to counsel women on careers and as a technical advisor to the Department of Aeronautics. [N 15] Early in 1936, Earhart started to plan a round-the-world flight. Not the first to circle the globe, it would be the longest at 29,000 miles (47,000 km), following a grueling equatorial route. With financing from Purdue,[N 16] in July 1936, a Lockheed Electra 10E was built at Lockheed Aircraft Company to her specifications, which included extensive modifications to the fuselage to incorporate a large fuel tank. Earhart dubbed the twin engine monoplane airliner her "flying laboratory" and hangared it at Mantz's United Air Services located just across the airfield from Lockheed's Burbank, California plant in which it had been built. Although the Electra was publicized as a "flying laboratory", little useful science was planned and the flight was arranged around Earhart's intention to circumnavigate the globe along with gathering raw material and public attention for her next book. Her first choice as navigator was Captain Harry Manning, who had been the captain of the President Roosevelt, the ship that had brought Earhart back from Europe in 1928. Through contacts in the Los Angeles aviation community, Fred Noonan was subsequently chosen as a second navigator because there were significant additional factors which had to be dealt with while using celestial navigation for aircraft. He had vast experience in both marine (he was a licensed ship's captain) and flight navigation. Noonan had recently left Pan Am, where he established most of the company's China Clipper seaplane routes across the Pacific. Noonan had also been responsible for training Pan American's navigators for the route between San Francisco and Manila. [N 17] The original plans were for Noonan to navigate from Hawaii to Howland Island, a particularly difficult portion of the flight; then Manning would continue with Earhart to Australia and she would proceed on her own for the remainder of the project. On March 17, 1937, Earhart and her crew flew the first leg from Oakland, California to Honolulu, Hawaii. In addition to Earhart and Noonan, Harry Manning and Mantz (who was acting as Earhart's technical advisor) were on board. Due to lubrication and galling problems with the propeller hubs' variable pitch mechanisms, the aircraft needed servicing in Hawaii. Ultimately, the Electra ended up at the United States Navy's Luke Field on Ford Island in Pearl Harbor. The flight resumed three days later from Luke Field with Earhart, Noonan and Manning on board. During the takeoff run, Earhart ground-looped, circumstances of which remain controversial. Some witnesses at Luke Field including the Associated Press journalist on the scene said they saw a tire blow. Earhart thought either the Electra's right tire had blown and/or the right landing gear had collapsed. Some sources, including Mantz, cited pilot error. On July 2, 1937, midnight GMT, Earhart and Noonan took off from Lae Airfield in the heavily loaded Electra. Their intended destination was Howland Island, a flat sliver of land 6,500 ft (2,000 m) long and 1,600 ft (500 m) wide, 10 ft (3 m) high and 2,556 miles (4,113 km) away. Their last known position report was near the Nukumanu Islands, about 800 miles (1,300 km) into the flight. The USCGC Itasca was on station at Howland, assigned to communicate with Earhart's Electra and guide them to the island once they arrived in the vicinity. Through a series of misunderstandings or errors (the details of which are still controversial), the final approach to Howland Island using radio navigation was not successful. Fred Noonan had earlier written about problems affecting the accuracy of radio direction finding in navigation. [N 18] Another cited cause of possible confusion was that the Itasca and Earhart planned their communication schedule using time systems set a half-hour apart, with Earhart using Greenwich Civil Time (GCT) and the Itasca under a Naval time zone designation system. Some sources have noted Earhart's apparent lack of understanding of her direction-finding system, which had been fitted to the aircraft just prior to the flight. The system was equipped with a new receiver from Bendix that operated on five wavelength "bands", marked 1 to 5. The loop antenna was equipped with a tuneable loading coil that changed the effective length of the antenna to allow it to work efficiently at different wavelengths. The tuner on the antenna was also marked with five settings, 1 to 5, but, critically, these were not the same frequency bands as the corresponding bands on the radio. The two were close enough for settings 1, 2 and 3, but the higher frequency settings, 4 and 5, were entirely different. Earhart's only training on the system was a brief introduction by Joe Gurr at the Lockheed factory, and the topic had not come up. A card displaying the band settings of the antenna was mounted so it was not visible. Gurr explained that higher frequency bands would offer better accuracy and longer range. The first calls, routine reports stating the weather as cloudy and overcast, were received at 2:45 and just before 5 am on July 2. These calls were broken up by static, but at this point the aircraft would still be a long distance from Howland. At 6:14 am another call was received stating the aircraft was within 200 miles (320 km), and requested that the ship use its direction finder to provide a bearing for the aircraft. Earhart began whistling into the microphone to provide a continual signal for them to home in on. It was at this point that the radio operators on the Itasca realized that their RDF system could not tune in the aircraft's 3015 kHz frequency; radioman Leo Bellarts later commented that he "was sitting there sweating blood because I couldn't do a darn thing about it." A similar call asking for a bearing was received at 6:45 am, when Earhart estimated they were 100 miles (160 km) out. At 7:42 am Earhart radioed "We must be on you, but cannot see you—but gas is running low. Have been unable to reach you by radio. We are flying at 1,000 feet [305 m]." Her 7:58 am transmission said she couldn't hear the Itasca and asked them to send voice signals so she could try to take a radio bearing. This transmission was reported by the Itasca as the loudest possible signal, indicating Earhart and Noonan were in the immediate area. They couldn't send voice at the frequency she asked for, so Morse code signals were sent instead. Earhart acknowledged receiving these but said she was unable to determine their direction. In her last known transmission at 8:43 am Earhart broadcast "We are on the line 157 337. We will repeat this message. We will repeat this on 6210 kilocycles. Wait." However, a few moments later she was back on the same frequency (3105 kHz) with a transmission which was logged as a "questionable": "We are running on line north and south." Earhart's transmissions seemed to indicate she and Noonan believed they had reached Howland's charted position, which was incorrect by about five nautical miles (10 km). The Itasca used her oil-fired boilers to generate smoke for a period of time but the fliers apparently did not see it. The many scattered clouds in the area around Howland Island have also been cited as a problem: their dark shadows on the ocean surface may have been almost indistinguishable from the island's subdued and very flat profile. Some of these reports of transmissions were later determined to be hoaxes but others were deemed authentic. Bearings taken by Pan American Airways stations suggested signals originating from several locations, including Gardner Island (Nikumaroro), 360 miles (580 km) to the SSE. It was noted at the time that if these signals were from Earhart and Noonan, they must have been on land with the aircraft since water would have otherwise shorted out the Electra's electrical system. [N 23][N 24] Sporadic signals were reported for four or five days after the disappearance but none yielded any understandable information. [N 25] The captain of the USS Colorado later said "There was no doubt many stations were calling the Earhart plane on the plane's frequency, some by voice and others by signals. All of these added to the confusion and doubtfulness of the authenticity of the reports." Later search efforts were directed to the Phoenix Islands south of Howland Island. A week after the disappearance, naval aircraft from the Colorado flew over several islands in the group including Gardner Island (now called Nikumaroro), which had been uninhabited for over 40 years. The subsequent report on Gardner read: "Here signs of recent habitation were clearly visible but repeated circling and zooming failed to elicit any answering wave from possible inhabitants and it was finally taken for granted that none were there... At the western end of the island a tramp steamer (of about 4000 tons)... lay high and almost dry head onto the coral beach with her back broken in two places. The lagoon at Gardner looked sufficiently deep and certainly large enough so that a seaplane or even an airboat could have landed or takenoff [sic] in any direction with little if any difficulty. Given a chance, it is believed that Miss Earhart could have landed her aircraft in this lagoon and swum or waded ashore. "[N 26] They also found that Gardner's shape and size as recorded on charts were wholly inaccurate. Other Navy search efforts were again directed north, west and southwest of Howland Island, based on a possibility the Electra had ditched in the ocean, was afloat, or that the aviators were in an emergency raft. The official search efforts lasted until July 19, 1937. At $4 million, the air and sea search by the Navy and Coast Guard was the most costly and intensive in U.S. history up to that time but search and rescue techniques during the era were rudimentary and some of the search was based on erroneous assumptions and flawed information. Official reporting of the search effort was influenced by individuals wary about how their roles in looking for an American hero might be reported by the press. [N 27] Despite an unprecedented search by the United States Navy and Coast Guard, no physical evidence of Earhart, Noonan or the Electra 10E was found. The aircraft carrier USS Lexington, the Colorado, and the Itasca (and even two Japanese ships, the oceanographic survey vessel Koshu and auxiliary seaplane tender Kamoi) searched for six–seven days each, covering 150,000 square miles (390,000 km2). Many ideas emerged after the disappearance of Earhart and Noonan. Two possibilities concerning the flyers' fate have prevailed among researchers and historians. Many researchers believe that the Electra ran out of fuel and that Earhart and Noonan ditched at sea. Navigator and aeronautical engineer Elgen Long and his wife Marie K. Long devoted 35 years of exhaustive research to the "crash and sink" theory, which is the most widely accepted explanation for the disappearance. United States Navy Captain Laurance Safford (retired) who was responsible for the interwar Mid-Pacific Strategic Direction Finding Net, and the decoding of the Japanese Purple cipher messages for the attack on Pearl Harbor, began a lengthy analysis of the Earhart flight during the 1970s. His research included the intricate radio transmission documentation. Safford came to the conclusion, "poor planning, worse execution". Rear Admiral Richard R. Black, USN, who was in administrative charge of the Howland Island airstrip and was present in the radio room on the Itasca, asserted in 1982 that "the Electra went into the sea about 10 am, July 2, 1937 not far from Howland". British aviation historian Roy Nesbit interpreted evidence in contemporary accounts and Putnam's correspondence and concluded Earhart's Electra was not fully fueled at Lae. William L. Polhemous, the navigator on Ann Pellegreno's 1967 flight which followed Earhart and Noonan's original flight path, studied navigational tables for July 2, 1937, and thought Noonan may have miscalculated the "single line approach" intended to "hit" Howland. David Jourdan, a former Navy submariner and ocean engineer specializing in deep-sea recoveries, has claimed any transmissions attributed to Gardner Island were false. Through his company Nauticos he extensively searched a 1,200-square-mile (3,100 km2) quadrant north and west of Howland Island during two deep-sea sonar expeditions (2002 and 2006, total cost $4.5 million) and found nothing. 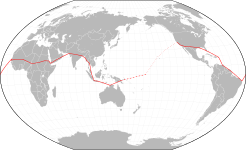 The search locations were derived from the line of position (157–337) broadcast by Earhart on July 2, 1937. Nevertheless, Elgen Long's interpretations have led Jourdan to conclude, "The analysis of all the data we have – the fuel analysis, the radio calls, other things – tells me she went into the water off Howland." Earhart's stepson George Palmer Putnam Jr. has been quoted as saying he believes "the plane just ran out of gas". Susan Butler, author of the "definitive" Earhart biography East to the Dawn, says she thinks the aircraft went into the ocean out of sight of Howland Island and rests on the seafloor at a depth of 17,000 feet (5 km). Tom D. Crouch, Senior Curator of the National Air and Space Museum, has said the Earhart/Noonan Electra is "18,000 ft. down" and may even yield a range of artifacts that could rival the finds of the Titanic, adding that "the mystery is part of what keeps us interested. In part, we remember her because she's our favorite missing person." The Gardner Island hypothesis assumes that Earhart and Noonan, having not found Howland Island, would not waste time searching for Howland. Instead, they would turn to the south and look for other islands. The 157/337 radio transmission suggests they flew a course of 157° that would take them past Baker Island; if they missed Baker Island, then sometime later they would fly over the Phoenix Islands, now part of the Republic of Kiribati, about 350 nautical miles (650 km) southsoutheast of Howland Island. The Garner Island hypothesis has the plane making it to Gardner Island (now Nikumaroro), one of the Phoenix Islands. As mentioned above, a week after Earhart disappeared, Navy planes from USS Colorado (which had sailed from Pearl Harbor) searched Gardner Island. The planes saw signs of recent habitation and the wreck of the SS Norwich City, but did not see any signs of Earhart's plane or people. After the Navy ended its search, G. P. Putnam undertook a search in the Phoenix Group and other islands, but nothing was found. In December 1938, laborers landed on the island and started constructing the settlement. Around April 1940, a skull is discovered and buried, but British colonial officer Gerald Gallagher does not learn of it until September 1940. In September 1940, Gallagher, a licensed pilot, instituted a search and then radioed his superiors that he had found a "skeleton ... possibly that of a woman," along with an old-fashioned sextant box, under a tree on the island's southeast corner. He was ordered to send the remains to Fiji. Gallagher believed there was a small chance that the skeleton was Earhart's. In 1941, British colonial authorities took detailed measurements of the bones and concluded they were from a male about 5 ft 5 in tall (165 cm). These bones were misplaced in Fiji long ago, so they cannot be reexamined. In 1998, an analysis of the measurement data by forensic anthropologists did not confirm the original findings, concluding instead that the skeleton had belonged to a "tall white female of northern European ancestry." Nevertheless, in July 2007, an editor at Avionews in Rome compared the Gardner Island hypothesis to other non-crash-and-sink theories and called it the "most confirmed" of them. TIGHAR's research has produced a range of documented archaeological and anecdotal evidence supporting this hypothesis. In 2007, a TIGHAR expedition visited Nikumaroro searching for unambiguously identifiable aircraft artifacts and DNA. The group included engineers, technical experts, archaeologists, anthropologists, and researchers. They found artifacts of uncertain origin on the weather-ravaged atoll, including bronze bearings which may have belonged to Earhart's aircraft and a zipper pull which might have come from her flight suit. In 2010, the research group said it had found bones that appeared to be part of a human finger. Subsequent DNA testing at the University of Oklahoma proved inconclusive as to whether the bone fragments were from a human or from a sea turtle. In July 2012, TIGHAR conducted an underwater expedition off the northwest reef of Nikumaroro, using sonar mapping. Some of the sonar images suggested a possible wreckage site, although Ric Gillespie, executive director of TIGHAR, cautioned that most of the Electra's parts would likely have disintegrated after 75 years in sea water. Nevertheless, in May 2013, TIGHAR announced that professional analysis of a 32-foot (9.8 m) anomaly in the sonar images showed what could possibly be the aircraft. Artifacts discovered by TIGHAR on Nikumaroro have included improvised tools; an aluminum panel, possibly from an Electra, made using 1930s manufacturing specifications; an oddly cut piece of clear Plexiglas the same thickness and curvature of an Electra window; and a size 9 Cat's Paw heel dating from the 1930s which resembles Earhart's footwear in world flight photos. [N 28] Recently rediscovered photos of Earhart's Electra just before departure in Miami show an aluminum panel over a window on the right side. Ric Gillespie, head of TIGHAR, claimed the found aluminum panel artifact has the same dimensions and rivet pattern as the one shown in the photo "to a high degree of certainty". Based on this new evidence, Gillespie returned to the atoll in June 2015, but operations using a remotely operated underwater vehicle to investigate a sonar detection of a possible wreckage were hampered by technical problems. Further, a review of sonar data concluded it was most like a coral ridge. The evidence remains circumstantial, but Earhart's surviving stepson, George Putnam Jr., has expressed support for TIGHAR's research. In 2016 The Times reported the TIGHAR story, alleging "compelling evidence" for this theory. Another theory purports that Amelia Earhart was captured by Japanese forces. This theory came about as a result of the similarities of Earhart's Lockheed Electra's components to the Mitsubishi A6M Zero. In 1966, CBS Correspondent Fred Goerner published a book claiming Earhart and Noonan were captured and executed when their aircraft crashed on the island of Saipan, part of the Mariana Islands archipelago, while it was under Japanese occupation. [N 29][N 30] In 2009, an Earhart relative stated that the pair died in Japanese custody, citing unnamed witnesses including Japanese troops and Saipan natives. He said that the Japanese cut the valuable Lockheed aircraft into scrap and threw the pieces into the ocean. In 1993 a former PAN AM pilot named Henri Keyzer-Andre published an autobiography called Age Of Heroes: Incredible Adventures of a PAN AM Pilot and his Greatest Triumph, Unravelling the Mystery of Amelia Earhart. This autobiography is about himself and his flying experiences during the early period of commercial air travel. In this action-packed memoir, he vividly describes trips to Siberia and China, as well as WW II missions transporting refugees across war zones. He subsequently spent 28 years with the State Department's Federal Aviation Authority, participating in diplomatic and, occasionally, covert assignments. While in Japan to assist in reviving its aviation industry, Keyzer-Andre uncovered information, documented in this book, that led him to conclude that Amelia Earhart, whose plane vanished somewhere in the Pacific in 1937, was shot down by the Japanese. In 1990, the NBC-TV series Unsolved Mysteries broadcast an interview with a Saipanese woman who claimed to have witnessed Earhart and Noonan's execution by Japanese soldiers. No independent confirmation or support has ever emerged for any of these claims. Purported photographs of Earhart during her captivity have been identified as either fraudulent or having been taken before her final flight. 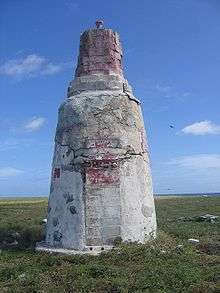 Since the end of World War II, a location on Tinian, which is five miles (8 km) southwest of Saipan, had been rumoured to be the grave of the two aviators. In 2004, a scientifically supported archaeological dig at the site failed to turn up any bones. The unresolved circumstances of Earhart's disappearance, along with her fame, attracted a great body of other claims relating to her last flight, all of which have been generally dismissed for lack of verifiable evidence. Several unsupported theories have become well known in popular culture. A World War II-era movie called Flight for Freedom (1943) starring Rosalind Russell and Fred MacMurray furthered a myth that Earhart was spying on the Japanese in the Pacific at the request of the Franklin Roosevelt administration. [N 31] By 1949, both the United Press and U.S. Army Intelligence had concluded this rumor was groundless. Jackie Cochran, another pioneering aviator and one of Earhart's friends, made a postwar search of numerous files in Japan and was convinced the Japanese were not involved in Earhart's disappearance. A rumor which claimed that Earhart had made propaganda radio broadcasts as one of the many women compelled to serve as Tokyo Rose was investigated closely by George Putnam. According to several biographies of Earhart, Putnam investigated this rumor personally but after listening to many recordings of numerous Tokyo Roses, he did not recognize her voice among them. Pacific Wrecks, a website that documents World War II-era aircraft crash sites, notes that no Electra has been reported lost in or around Papua New Guinea. Gillespie wrote that the 2,000-mile (3,200 km) distance from Earhart's last known position to New Britain was impossible for the aircraft to fly, requiring more than 13 hours of flight when there were only 4 hours of fuel remaining. In November 2006, the National Geographic Channel aired episode two of the Undiscovered History series about a claim that Earhart survived the world flight, moved to New Jersey, changed her name, remarried and became Irene Craigmile Bolam. This claim had originally been raised in the book Amelia Earhart Lives (1970) by author Joe Klaas, based on the research of Major Joseph Gervais. Irene Bolam, who had been a banker in New York during the 1940s, denied being Earhart, filed a lawsuit requesting $1.5 million in damages and submitted a lengthy affidavit in which she refuted the claims. The book's publisher, McGraw-Hill, withdrew the book from the market shortly after it was released and court records indicate that they made an out-of-court settlement with her. Subsequently, Bolam's personal life history was thoroughly documented by researchers, eliminating any possibility she was Earhart. Kevin Richlin, a professional criminal forensic expert hired by National Geographic, studied photographs of both women and cited many measurable facial differences between Earhart and Bolam. In 1967, Ann Dearing Holtgren Pellegreno and a crew of three successfully flew a similar aircraft (a Lockheed 10A Electra) to complete a world flight that closely mirrored Earhart's flight plan. On the 30th anniversary of her disappearance, Pellegreno dropped a wreath in Earhart's honor over tiny Howland Island and returned to Oakland, completing the 28,000-mile (45,000 km) commemorative flight on July 7, 1967. In 2013, Amelia Rose Earhart, a pilot and reporter from Denver Colorado, announced that she would be recreating the 1937 flight during the Summer of 2014 in a single engine Pilatus PC-12NG. She completed the flight without incident on July 11, 2014. Countless other tributes and memorials have been made in Amelia Earhart's name, including a 2012 tribute from Secretary of State Hillary Clinton, speaking at a State Department event celebrating the ties of Earhart and the United States to its Pacific neighbors, noting: "Earhart ... created a legacy that resonates today for anyone, girls and boys, who dreams of the stars." In 2013, Flying magazine ranked Earhart No. 9 on their list of the "51 Heroes of Aviation". The following list is not considered definitive, but serves also to give significant examples of tributes and honors. Earhart Corona, a corona on Venus was named by the IAU in 1982. Tio commemorate her first transatlantic flight, on the Millennium Coastal Path at Pwll, Burry Port, South Wales is a blue plaque sponsored by Llanelli Community Heritage. In 2015, a newly discovered Lunar Crater was provisionally named after Amelia Earhart. The 1943 Rosalind Russell film Flight for Freedom derived from a treatment, "Stand by to Die", was a fictionalized treatment of Earhart's life. Possibly the first tribute album dedicated to the legend of Earhart was by Plainsong, In Search of Amelia Earhart, Elektra K42120, released in 1972. Both the album and the Press Pak released by Elektra are highly prized by collectors and have reached cult status. Singer Joni Mitchell's song "Amelia" appears on her 1976 album Hejira and also features in the video of her 1980 live album Shadows and Light (1980) with clips of Earhart. Commenting on the origins of the song, which interweaves the story of a desert journey with aspects of Earhart's disappearance, Mitchell said: "I was thinking of Amelia Earhart and addressing it from one solo pilot to another ... sort of reflecting on the cost of being a woman and having something you must do." "In Search of: Amelia Earhart," (1976) was episode 16 of the 1976–1982 In Search Of series; this episode spurred a number of popular documentaries that followed. A 1976 television bio production titled Amelia Earhart starring Susan Clark and John Forsythe included flying by Hollywood stunt pilot Frank Tallman whose late partner in Tallmantz Aviation, Paul Mantz, had tutored Earhart in the 1930s. In the 1978 novel "Wings" by Robert J. Serling, Earhart appears as an acquaintance and romantic interest of the novel's protagonist, Barney Burton. The documentary Amelia Earhart: The Price of Courage (1993) from American Experience. Amelia Earhart: The Final Flight (1994) starring Diane Keaton, Rutger Hauer and Bruce Dern was initially released as TV movie and subsequently released as a theatrical feature. Academy Award nominee Amy Adams portrayed Earhart in Night at the Museum 2: Battle of the Smithsonian (2009). In Amelia (2009), Earhart is portrayed by Hilary Swank, who also served as co-executive producer of the biopic. In 2011, the Great Canadian Theatre Company hosted a musical play titled Amelia: The Girl Who Wants To Fly. Google honored Earhart on her 115th birthday anniversary by putting up a doodle on its site on July 24, 2012. 20 Hrs., 40 Min. (1928) was a journal of her experiences as the first woman passenger on a transatlantic flight. The Fun of It (1932) was a memoir of her flying experiences and an essay on women in aviation. Last Flight (1937) featured the periodic journal entries she sent back to the United States during her world flight attempt, published in newspapers in the weeks prior to her final departure from New Guinea. Compiled by her husband GP Putnam after she disappeared over the Pacific, many historians consider this book to be only partially Earhart's original work. ↑ Charles Kuralt said on CBS television program Sunday Morning, referring to Earhart: "She was a pioneer in aviation... she led the way so that others could follow and go on to even greater achievements," further stating, "trailblazers prepare the rest of us for the future." ↑ Earhart set several records, being the first woman to fly across the Atlantic, first as a passenger and later, as a solo pilot; the period term for a female pilot was "aviatrix", and is still in use. ↑ Quote: "She vanished nearly 60 years ago, but fascination with Amelia Earhart continues through each new generation." ↑ Quote: "...the judge nevertheless adored his brave and intelligent granddaughter and in her [Earhart's] love of adventure, she seemed to have inherited his pioneering spirit." ↑ Although a good student, Earhart cut short her time at Ogontz when she became a nursing assistant in Canada. ↑ Putnam himself may have coined the term "Lady Lindy." ↑ Quote: "Amelia eventually said yes – or rather nodded yes – to GP's sixth proposal of marriage. ↑ Quote: "It was pencilled longhand... a slip or two in spelling meticulously corrected." The later typewritten note has the word medieval incorrectly spelled. The original note has some slight variances in the header, use of commas and the salutation but is spelled correctly. ↑ Earhart's Vega 5B was her third, after trading in two Vega 1s at the Lockheed Aircraft Company's Burbank plant. ↑ Bernt Balchen had been instrumental in other transatlantic and Arctic record-breaking flights during that period. ↑ Franklin D. Roosevelt was not in favor of his wife becoming a pilot. Eleanor Roosevelt would later feature prominently in another aviation-related cause when she took a famous flight with a young Black aviator that helped establish the credentials of the "Tuskegee Airmen". ↑ The first flight between California and Hawaii was completed on June 28–29, 1927 by the Army Air Corps tri-motor Bird of Paradise. ↑ "Old Bessie" started out as a Vega 5 built in 1928 as c/n 36, but was modified with a replacement fuselage to become a 5B. ↑ Amelia preferred the more benign weather of the west coast for flying and based her later years' operation from California rather than the east coast. ↑ Her job at Purdue was outlined by Edward C. Elliott, the President of Purdue University. ↑ Purdue University established the Amelia Earhart Fund for Aeronautical Research at $50,000 to fund the purchase of the Lockheed Electra 10E. ↑ Noonan also navigated the China Clipper on its first flight to Manila, departing Alameda under the command of Captain Ed Musick, on November 22, 1935. ↑ Noonan, Fred. Memo to Operations Manager, Pacific Division, Pan American Airlines, April 29, 1935: "The inaccuracies of direction finding bearings can be very definitely cataloged: twilight effects, faint signals, wide splits of minima and inaccurate calibration." ↑ Quote: "Frequencies between 2,504 to 3,497.5 kc were allocated to "Coastal harbor, government, aviation, fixed, miscellaneous." ↑ The height of the antenna is important, a horizontally polarized antenna operating at a small fraction of its wavelength above the ground will be less efficient than that same antenna operating at cruising altitude. ↑ Safford disputes a "sun line" theory and proposes that Noonan asked Earhart to fly 157–337 magnetic or to fly at right angles to the original track on north–south courses. ↑ A teenager in the northeastern United States claims to have heard post-loss transmissions from Earhart and Noonan but modern analysis has shown there was an extremely low probability of any signal from Amelia Earhart being received in the United States on a harmonic of a frequency she could transmit upon. ↑ The essential components were all mounted low, including the generator, batteries, dynamotor and transmitter. ↑ In order to operate the radio for any length of time, the aircraft would have had to be standing more or less upright on its landing gear with the right engine running in order to charge the 50-watt transmitter's battery, which would have consumed six gallons of fuel per hour. ↑ The first two days were marked by rumors and misinformation regarding radio transmission capabilities of the Lockheed Model 10 Electra that were finally resolved by the aircraft company. ↑ Memo from Senior Aviator, USS Colorado, to The Chief of the Bureau of Aeronautics, "Aircraft Search of Earhart Plane." Their commander Capt Friedell made no note of "recent habitation" in his official summary. ↑ FDR himself had to respond to accusations that the search was justified. ↑ According to records, Noonan was 6 ft (1.8 m) tall and Earhart was 5 ft 8 in (1.73 m) and wore a size 6 shoe according to her sister. ↑ Goerner's book was immediately challenged, but the Time Magazine article on it does include a quote from Admiral Chester W. Nimitz, who allegedly told Goerner in March 1965: "I want to tell you Earhart and her navigator did go down in the Marshalls and were picked up by the Japanese." ↑ Goerner disclosed in his book that Nimitz refused permission to be quoted. ↑ Some authors have speculated that Earhart and Noonan were shot down by Japanese aircraft as she was thought to be spying on Japanese territory so America could supposedly plan an attack. ↑ Morey 1995, p. 11. ↑ Ferdinando, Lisa. "Clinton Celebrates Pioneer Aviatrix Amelia Earhart." Voice of America, March 19, 2012. ↑ Goldstein and Dillon 1997, pp. 111, 112. 1 2 Lovell 1989, p. 152. ↑ "Timeline: Equal Rights Amendment, Phase One: 1921–1972." feminism101.com. Retrieved: June 4, 2012. ↑ Francis, Roberta W. "The History Behind the Equal Rights Amendment." equalrightsamendment.org. Retrieved: June 4, 2012. ↑ "The Mystery of Amelia Earhart". Social Studies School Service. Retrieved: June 3, 2012. ↑ "A/E11/M-129, Earhart, Amy Otis, 1869–1962. Papers, 1944, n.d.: A Finding Aid." Harvard University Library. Retrieved: June 3, 2012. 1 2 3 Goldstein and Dillon 1997, p. 8. 1 2 Goldstein and Dillon 1997, p. 9. ↑ "Grace Muriel Earhart Morrissey." The Ninety-Nines. Retrieved: June 3, 2012. ↑ Goldstein and Dillon 1997, pp. 8–9. ↑ Randolph 1987, p. 16. ↑ Rich 1989, p. 4. ↑ Lovell 1989, p. 14. 1 2 "Biography." The Official Website of Amelia Earhart (The Family of Amelia Earhart). Retrieved: June 4, 2012. ↑ Goldstein and Dillon 1997, p. 14. ↑ Morrissey 1963, pp. 17–18. ↑ Randolph 1987, p. 18. ↑ Lovell 1989, p. 15. ↑ Hamill 1976, p. 51. ↑ Garst 1947, p. 35. ↑ Blau 1977, pp. 10–11. ↑ Rich 1989, p. 11. ↑ Long 1999, p. 33. ↑ Kerby 1990, pp. 18–19. ↑ Popplewell, Brett. "The city Amelia loved." Toronto Star, June 29, 2008. Retrieved: June 30, 2008. ↑ "Portrait of Earhart as a volunteer nurse in Toronto." Amelia Mary Earhart Papers, Schlesinger Library on the History of Women in America, Radcliffe Institute. Retrieved: May 16, 2013. 1 2 3 4 5 Lovell 1989, p. 27. 1 2 3 Earhart 1932, p. 21. 1 2 3 Backus 1982, pp. 49–50. ↑ Rich 1989, pp. 31–32. ↑ Earhart 1937, p. 2. ↑ Earhart 1937, p. 3. ↑ Thames 1989, p. 7. ↑ Earhart 1937, p. 4. ↑ "Lady Lindy, Amelia Earhart's Life History." aviationhistory.org. Retrieved: October 12, 2009. ↑ Marshall 2007, p. 21. ↑ Blau 1977, pp. 15–16. ↑ Long 1999, p. 36. ↑ "Aerospace: Amelia Earhart 1897–1937." U-S-History.com. Retrieved: June 3, 2012. ↑ Goldstein and Dillon 1997, p. 33. ↑ ""Amelia Earhart Biographical Sketch."". Archived from the original on April 1, 2008. Retrieved 2009-12-31. CS1 maint: BOT: original-url status unknown (link) George Palmer Putnam Collection of Amelia Earhart Papers, Purdue University. Retrieved: June 3, 2012. ↑ Rich 1989, p. 43. ↑ Long 1999, p. 38. ↑ Chaisson, Stephanie. "Squantum has a hold on its residents." The Patriot Ledger newspaper, Quincy, Massachusetts, July 12, 2007. ↑ Randolph 1987, p. 41. ↑ Bryan 1979, p. 132. ↑ Southampton: A pictorial peep into the past. Southern Newspapers Ltd, 1980. ↑ "1927 Avro Avian." goldenwingsmuseum.com. Retrieved: July 1, 2013. ↑ Goldstein and Dillon 1997, p. 55. ↑ Glines 1997, p. 44. 1 2 Rich 1989, p. 177. 1 2 Pearce 1988, p. 76. ↑ Crouch, Tom D. "Searching for Amelia Earhart." Invention & Technology, Summer 2007 via americanheritage.com. Retrieved: July 2, 2010. ↑ Lovell 1989, p. 135. ↑ "Biography of Amelia Earhart." Amelia Earhart Birthplace Museum. Retrieved: July 2, 2010. 1 2 Glines 1997, p. 45. ↑ Boston and Maine Railroad Employees Magazine, Volume 8, Number 10, July 1933, copy in Purdue University Special Collections. ↑ Rich 1989, p. 73. 1 2 Mendieta, Carlene. "Amelia Earhart's Flight Across America: Rediscovering a Legend." ameliaflight.com. Retrieved: May 21, 2007. ↑ Rich 1989, p. 85. ↑ Lauber 1989, p. 47. ↑ Jessen 2002, p. 193. ↑ San Bernardino County Sun. August 26, 1929. ↑ Van Pelt 2008, pp. 20–21. ↑ Corn 1983, p. 75. ↑ Oakes 1985, p. 31. ↑ Lovell 1989, pp. 130, 138. ↑ Pearce 1988, p. 81. ↑ Lovell 1989, pp. 165–166. ↑ "Newly Discovered Amelia Earhart Letter Shows Her Wild Side." Wireless Flash News, February 25, 2003. Retrieved: July 2, 2010. ↑ Patterson-Neubert, Amy. "Public to get first look at Amelia Earhart's private life." Purdue News, 2003. Retrieved: July 2, 2010. ↑ Pearce 1988, p. 82. ↑ ""Dorothy Binney Putnam Upton Blanding Palmer 1888–1982."". Archived from the original on June 4, 2004. Retrieved 2007-04-01. CS1 maint: BOT: original-url status unknown (link) St. Lucie Historical Society, Inc. Retrieved: July 1, 2013. ↑ "Edwin Binney 1866–1934." St. Lucie Historical Society, Inc. Retrieved: June 3, 2012. ↑ Lovell 1989, pp. 154, 174. 1 2 "Eighty years since famed flight; Anniversary Amelia Earhart's stop in Saint John may have been brief but pivotal in record-breaking feat". The Telegraph-Journal, May 19, 2012. ↑ Parsons 1983, pp. 95–97. ↑ "Lockheed Vega NV7952." Davis-Monthan Aviation Field Register, September 11, 2011. ↑ Butler 1997, p. 263. ↑ Goddard, Seth. ""Life Hero of the Week Profile: Amelia Earhart—First Lady of the Sky."". Archived from the original on October 5, 2002. Retrieved 2008-03-29. CS1 maint: BOT: original-url status unknown (link) life.com, May 19, 1997. Retrieved: July 1, 2013. ↑ ""Amelia Earhart Centre."". Archived from the original on March 10, 2006. Retrieved 2006-11-22. CS1 maint: BOT: original-url status unknown (link) Derry City Council Heritage and Museum Service. Retrieved: July 1, 2013. ↑ Glines 1997, p. 47. ↑ Leder 1987, p. 49. 1 2 Goldstein and Dillon 1997, p. 132. ↑ Allen 1964, pp. 199, 200, 202. ↑ Lovell 1989, p. 218. ↑ Oakes 1985, p. 35. 1 2 Goldstein and Dillon 1997, p. 145. ↑ Earhart 1937, p. 37. ↑ Lovell 1989, p. 209. ↑ Sloate 1990, p. 64. ↑ Altman, Elizabeth. "Amelia Earhart home, Toluca Lake, 2003." Oviatt Library Digital Archives, Delmar T. Oviatt Library, Urban Archives Center, California State University, Northridge, California. Photo: As of 29 September 2003. Retrieved: September 23, 2011. ↑ "History of Toluca Lake." TolucaLakeChamber.com. Retrieved: September 15, 2010. ↑ Butler 1997, p. 341. ↑ Long 1999, pp. 53–54. 1 2 Goldstein and Dillon 1997, p. 150. ↑ "Lockheed Model 10E Electra c/n: 1055 Reg: NR16020." PacificWrecks.com, January 5, 2011. ↑ Long 1999, p. 59. ↑ "Miss Earhart to get 'Flying Laboratory'." The New York Times, April 20, 1936, p. 3. ↑ Long 1999, p. 65. ↑ Post and Gatty 1931, pp. 45–56. ↑ Grooch 1936, pp. 177, 189. 1 2 Rich 1989, p. 245. ↑ Leder 1987, p. 48. ↑ Waitt, Ted. "The Search for Amelia." Waitt Institute for Discovery. Retrieved: June 19, 2013. 1 2 3 4 Hoversten 2007, pp. 22–23. ↑ Long 1999, p. 116. ↑ Fleming 2011, p. 2. ↑ Fleming 2011, p. 3. ↑ Fleming 2011, p. 4. ↑ Jacobson, Randall S., PhD. "The Final Flight. Part 3: At Howland Island." tighar.org, 2009. Retrieved: July 10, 2010. ↑ "Earhart Navigation FAQ." tighar.org. Retrieved: July 10, 2010. ↑ American Radio Relay League 1945, p. 453. ↑ Long 1999, p. 20. ↑ Everette, Michael. "Electric Radio Communications Equipment Installed on Board Lockeed Electra NR16020." tighar.org, 2009. Retrieved: July 10, 2010. ↑ American Radio Relay League 1945, pp. 196–199. ↑ Safford et al. 2003, p. 145. ↑ Brandenberg, Bob. "Probability of Betty Hearing Amelia on a Harmonic Gardner Sunset: 0538Z Sunrise: 1747Z," tighar.org, 2007. Retrieved: July 10, 2010. ↑ Gillespie 2006, p. 115. ↑ Strippel 1995, p. 18. ↑ Gillespie 2006, diagram p. 190. ↑ Gillespie 2006, p. 140. ↑ Goldstein and Dillon 1997, p. 241. ↑ Gillespie 2006, p. 146. 1 2 Goldstein and Dillon 1997 p. 251. ↑ Goldstein and Dillon 1997, p. 248. ↑ Finding Amelia DVD, Annapolis, Maryland: Naval Institute Press, 2006. DVD: Contents: Reports: Lambrecht.pdf, p. 3. ↑ Goldstein and Dillon 1997, p. 254. ↑ Safford et al. 2003, pp. 61–62, 67–68. ↑ Goldstein and Dillon 1997, pp. 254–255. ↑ Goldstein and Dillon 1997, pp. 245–254. ↑ King et al. 2001, pp. 32–33. ↑ Goldstein and Dillon 1997, p. 257. ↑ Van Pelt 2005, p. 205. ↑ Long, Elgen. "'Crash and Sink' Theory". elgenlong.com, 2006. Retrieved: July 2, 2009. 1 2 3 Strippel 1995, p. 20. ↑ Strippel 1995, p. 58. ↑ Strippel 1995, pp. 58, 60. ↑ Kleinberg, Eliot. "Amelia Earhart's disappearance still haunts her stepson, 83". Palm Beach Post, December 27, 2004. Retrieved: July 1, 2013. ↑ Thurman, Judith. "Missing Woman: Amelia Earhart's flight". The New Yorker, September 14, 2009. Retrieved: July 26, 2010. ↑ "Amelia Earhart: Susan Butler interview". History Detectives, Season 7 video. Via PBS.org. Retrieved: July 26, 2010. ↑ Rich 1989, pp. 272–273. ↑ "Bones chronology." tighar.org, 2010. Retrieved: August 25, 2010. ↑ Gast, Phil. "DNA tests on bone fragment inconclusive in Amelia Earhart search." CNN, March 4, 2011. ↑ "Loran-History, Loran Unit 92, Gardner Island." loran-history.info. Retrieved: August 30, 2011. ↑ "Earhart Project Expeditions." tighar.org, May 14, 2010. Retrieved: August 25, 2010. ↑ Nuwer, Rachel. "Will We Ever Discover What Happened to Amelia Earhart?" BBC.com, June 28, 2013. Retrieved: June 29, 2013. ↑ Jacobson, Randall S., PhD "The Final Flight. 4: The Airplane Returns to Earth." tighar.org, 2009. Retrieved: July 10, 2010. ↑ Lee, Matthew. "Hillary Clinton Wades Into Amelia Earhart Mystery." Huffington Post, March 20, 2012. ↑ "The end of Amelia Earhart (2): several theories." Avio News (WAPA), July 16, 2007. Retrieved: July 17, 2007. 1 2 "Common Earhart Myths." tighar.org, Copyright date of 2009 on page. Retrieved: November 28, 2009. ↑ "The TIGHAR Hypothesis." tighar.org, Summer 2009. Retrieved: November 28, 2009. ↑ Pyle, Richard. "New search begins in Earhart mystery." USA Today, July 12, 2007. Retrieved: June 29, 2013. ↑ "TIGHAR 2007 Expedition Updates" tighar.org, August, 2007. Retrieved: June 29, 2013. ↑ Gast, Phil. "DNA tests on bone fragment inconclusive in Amelia Earhart search" www.cnn.com, March 3, 2011, Retrieved: March 3, 2011. ↑ "Amelia Earhart Underwater video reveals evidence solves 75 year mystery aviators flight." Daily Mail, August 18, 2012. Retrieved: March 10, 2013. ↑ Lorenzi, Rossella. "Pieces of Amelia Earhart's plane located?" Discovery Communications, LLC, November 18, 2012. Retrieved: March 10, 2013. ↑ Zap, Claudine. "Sonar image may show Amelia Earhart’s plane." News.yahoo.com. Retrieved: May 30, 2013. ↑ Sample, Ian. "Pacific sonar 'streak' may be wreck of Amelia Earhart's plane." guardian.co.uk Retrieved: May 31, 2013. ↑ Pyle, Richard. "Diary a clue to Amelia Earhart mystery." AP via "Huffington Post," March 31, 2007. Retrieved: June 29, 2013. ↑ "Amelia Earhart plane fragment identified." U.S. History, October 28, 2014. ↑ Lorenzi, Rossella. "Amelia Earhart plane fragment identified." Discovery Newsletter, October 28, 2014. ↑ "Niku VIII final report"
↑ Cruikshank, Joe. "The Search for Earhart's Plane Continues." Treasure County Palm News, November 4, 2006. Retrieved: April 1, 2007. ↑ "The Times" 12 Sept 2016 page 3 - "Pioneer pilot may have died a castaway on Pacific island"
↑ "Obituary: Fred Goerner, Broadcaster, 69." The New York Times, September 16, 1994. ↑ "Sinister Conspiracy?" Time Magazine, September 16, 1966. Retrieved: July 2, 2009. ↑ Goerner 1966, p. 304. 1 2 Henley, David C. "Cousin: Japanese captured Amelia Earhart." Nevada Appeal, October 31, 2009. Retrieved: November 7, 2009. Archived October 5, 2013, at the Wayback Machine. ↑ "Nonfiction Book Review: Age of Heroes Incredible Adve by Henri Keyzer-Andre, Author, Hy Steirman, Author Hastings House Book Publishers $22.5 (302p) ISBN 978-0-8038-9351-1". PublishersWeekly.com. Retrieved 2016-03-28. ↑ Strippel 1995, p. 52. ↑ "Amelia Earhart FAQ." tighar.org. Retrieved: July 10, 2010. ↑ "TIGHARS on Tinian." tighar.org, November 7, 2004. Retrieved: July 2, 2009. ↑ Cochran 1954, p. 160. ↑ Goldstein and Dillon 1997, p. 282. ↑ "The Enduring Mystery of Amelia Earhart's Disappearance Maybe Finally Coming To an End." The Atlantic Flyer, September 2007, p. 3. 1 2 3 Billings, David. "Aircraft Search Project in Papua New Guinea." Wings Over Kansas, 2000. Retrieved: March 27, 2012. ↑ "Angwin, Donald Arthur." Commonwealth of Australia: Military Forces, 2002. Retrieved: March 27, 2012. ↑ "Amelia Earhart Myths from the Pacific War." Pacific Wrecks, 2011. Retrieved: March 27, 2012. ↑ Gillespie, Ric. "Amelia Earhart Survived by Colonel Rollin Reineck, USAF (ret. ), 2003." tighar.org. Retrieved: July 10, 2010. ↑ Gillespie, Ric. "Is This Amelia Earhart?" tighar.org,, 2009. Retrieved: July 10, 2010. ↑ Strippel 1995, pp. 52–53. ↑ Hamill 1976, p. 49. ↑ Regis 2008, pp. 102–105. ↑ "The Yellow Brick Road Trip." theyellowbrickroadtrip.blogspot.com. Retrieved: July 2, 2009. ↑ "Amelia Earhart's plane." History Detectives, 2009. Retrieved: July 24, 2010. ↑ "2014 Round-the-world Flight." Amelia Flight, June 2014. ↑ Lee, Henry K. "Amelia Rose Earhart completes round-the-world flight." SFgate.com, July 11, 2014. ↑ "Earhart broke social and aviation barriers, Clinton says." U.S. Department of State, 20 March 2012. ↑ "51 Heroes of Aviation" Amelia Earhrt." Flying, September 2013. ↑ "Kansas City Airport." Kansas Government Journal, Volume 44, 1958, p. 20. Retrieved: June 25, 2010. ↑ "Purdue unveils Amelia Earhart sculpture." Purdue University News Service, April 16, 2009. Retrieved: June 25, 2010. ↑ "Feature Information: Venus: Earhart." U.S.G.S. Gazetteer of Planetary Nomenclature. Retrieved: June 25, 2010. ↑ "The Amelia Earhart Birthplace Museum." ameliaearhartmuseum.org. Retrieved: June 25, 2010. ↑ "Amelia Earhart Playhouse." wiesbaden.army.mil. Retrieved: January 21, 2010. 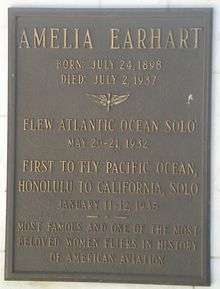 ↑ "Amelia Earhart plaque." Llanelli Community Heritage. Retrieved: March 10, 2013. ↑ O'Neill, Ian. "Hidden Moon crater named after Amelia Earhart. DNews, March 17, 2015. Retrieved: May 29, 2015. ↑ Rincon. Paul. "New lunar crater named after aviation pioneer Earhart." BBC News, March 17, 2015. Retrieved: May 29, 2015. ↑ "In Search of Amelia Earhart/Now We Are Three." andyrobertsmusic.com. Retrieved: July 2, 2010. ↑ "News Archive: Your link to SouthCoast Massachusetts and beyond." SouthCoastToday.com, February 14, 2012. Retrieved: February 21, 2012. ↑ Serling, Robert J. Wings. 1978. ↑ "Amelia Earhart: The Price of Courage (1993)." American Experience. Retrieved: February 23, 2010. ↑ McCallion, Bernadette. "Amelia Earhart: The Final Flight (1994)." The New York Times. Retrieved: December 26, 2011. ↑ Fleming, Michael. "Hilary Swank to play Amelia Earhart: Mira Nair to direct biopic from Ron Bass script." Variety, February 7, 2008. Retrieved: December 8, 2008. ↑ "Amelia: The Girl Who Wants to Fly". Archived from the original on December 30, 2011. Retrieved 2011-10-06. CS1 maint: BOT: original-url status unknown (link). Great Canadian Theatre Company. Retrieved: October 6, 2011. ↑ Sloate 1990, pp. 116–117. Allen, Richard Sanders. Revolution in the Sky: Those Fabulous Lockheeds, The Pilots Who Flew Them. Brattleboro, Vermont: The Stephen Greene Press, 1964. Backus, Jean L. Letters from Amelia 1901–1937. Boston: Beacon Press, 1982. ISBN 0-8070-6703-2. Blau, Melinda. Whatever Happened to Amelia Earhart? Milwaukee, Wisconsin: Contemporary Perspectives Inc., 1977. ISBN 0-8172-1057-1. Butler, Susan. East to the Dawn: The Life of Amelia Earhart. Reading, Massachusetts: Addison-Wesley, 1997. ISBN 0-306-80887-0. Cochran, Jacqueline. Stars at Noon. Boston: Little, Brown and Company, 1954. Corn, Joseph J. The Winged Gospel. New York: Oxford University Press, 1983. ISBN 0-19-503356-6. Crouch, Thomas D. "Searching for Amelia Earhart." Invention & Technology, Volume 23, Issue 1, Summer 2007. Fleming, Candace. Amelia Lost: The Life and Disappearance of Amelia Earhart. New York: Random House, 2011. ISBN 978-0-375-84198-9. Earhart, Amelia. Last Flight. New York: Harcourt, Brace and Company (first edition: Putnam), 1937. Garst, Shannon. Amelia Earhart: Heroine of the Skies. New York: Julian Messner, Inc., 1947. No ISBN. Gillespie, Ric. Finding Amelia: The True Story of the Earhart Disappearance. Annapolis, Maryland: Naval Institute Press, 2006. ISBN 1-59114-319-5. Glines, C.V. "'Lady Lindy': The Remarkable Life of Amelia Earhart." Aviation History, July 1997. Goerner, Fred. The Search for Amelia Earhart. New York: Doubleday, 1966. ISBN 0-385-07424-7. Goldstein, Donald M. and Katherine V. Dillon. Amelia: The Centennial Biography of an Aviation Pioneer. Washington, D.C.: Brassey's, 1997. ISBN 1-57488-134-5. Grooch, William Stephen. Skyway to Asia. New York: Longmans, Green and Co., 1936. No ISBN. Hamill, Pete. "Leather and Pearls: The Cult of Amelia Earhart." MS Magazine, September 1976. Hoverstein, Paul. "An American Obsession". Air & Space Smithsonian, Vol. 22, No. 2, June/July 2007. Jessen, Gene Nora. The Powder Puff Derby of 1929: The First All Women's Transcontinental Air Race. Naperville, Illinois: Sourcebooks, 2002. ISBN 978-1-57071-769-7. Kerby, Mona. Amelia Earhart: Courage in the Sky (Women of our Time series). New York: Puffin Books, 1990. ISBN 0-14-034263-X. King, Thomas F. et al. Amelia Earhart's Shoes. Walnut Creek, California: AltaMira Press, 2001. ISBN 0-7591-0130-2. Lauber, Patricia. Lost Star: The Story of Amelia Earhart. New York: Scholastic, 1989. ISBN 0-590-41159-4. Leder, Jane. Amelia Earhart (Great Mysteries: Opposing Viewpoints). San Diego: Greehaven Press, Inc., 1989. ISBN 0-89908-070-7. Long, Elgen M. and Marie K. Amelia Earhart: The Mystery Solved. New York: Simon & Schuster, 1999. ISBN 0-684-86005-8. Lovell, Mary S. The Sound of Wings. New York: St. Martin's Press, 1989. ISBN 0-312-03431-8. Marshall, Patti. "Neta Snook". Aviation History, Vol. 17, No. 3, January 2007, pp. 21–22. Morey, Eileen. The Importance of Amelia Earhart. San Diego: Lucent Books, 1995. ISBN 1-56006-065-4. Morrissey, Muriel Earhart. Courage is the Price: The Biography of Amelia Earhart. Wichita, Kansas: McCormick-Armstrong Publishing Division, 1963. ISBN 1-141-40879-1. Oakes, Claudia M. United States Women in Aviation 1930–1939. Washington, D.C.: Smithsonian Institution Press, 1985. ISBN 0-87474-380-X. Parsons, Bill with Bill Bowman. The Challenge of the Atlantic: A Photo-Illustrated History of Early Aviation in Harbour Grace, Newfoundland. St. John's, Newfoundland and Labrador: Robinson-Blackmore Book Publishers, 1983. ISBN 0-920884-06-7. Pearce, Carol Ann. Amelia Earhart. New York: Facts on File, 1988. ISBN 0-8160-1520-1. Post, Wiley and Harold Gatty. "Chapter III, "Driving from the back seat." Around the World in Eight Days. New York: Rand McNally & Company, 1931. Randolph, Blythe. Amelia Earhart. New York: Franklin Watts, 1987. ISBN 0-531-10331-5. Regis, Margaret. When Our Mothers Went to War: An Illustrated History of Women in World War II. Seattle: NavPublishing, 2008. ISBN 978-1879932050. Rich, Doris L. Amelia Earhart: A Biography. Washington, D.C.: Smithsonian Institution Press, 1989. ISBN 1-56098-725-1. Sloate, Susan. Amelia Earhart: Challenging the Skies. New York: Fawcett Books, 1990. ISBN 978-0-449-90396-4 . Strippel, Richard G. Amelia Earhart: The Myth and the Reality. New York: Exposition Press, 1972. ISBN 0-682-47447-9. Strippel, Richard G. "Researching Amelia: A Detailed Summary for the Serious Researcher into the Disappearance of Amelia Earhart." Air Classics, Vol. 31, No. 11, November 1995. Thames, Richard. Amelia Earhart. New York: Franklin Watts, 1989. ISBN 0-531-10851-1. Van Pelt, Lori. Amelia Earhart: The Sky's No Limit. London: Macmillan, 2005. ISBN 978-0-7653-1061-3. Van Pelt, Lori. "Amelia's Autogiro Adventures." Aviation History, March 2008. Ware, Susan. Still Missing: Amelia Earhart and the Search for Modern Feminism. New York: W.W. Norton & Company, 1993. ISBN 0-393-03551-4. Haynsworth, Leslie and David Toomey. Amelia Earhart's Daughters: The Wild and Glorious Story of American Women Aviators from World War II to the Dawn of the Space Age. New York: Harper Collins Publishers Inc., 1998. ISBN 0-380-72984-9. Booknotes interview with Susan Butler on East to the Dawn: The Life of Amelia Earhart, December 14, 1997. "Skeptoid #295: Finding Amelia Earhart". Skeptoid.